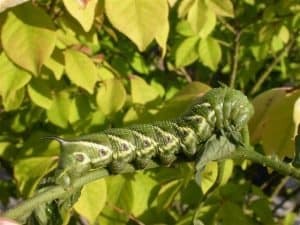 I was doing maintenance in the vegetable garden today and found three very large and healthy Tomato Hornworms which will soon pupate and become a Five-spotted Hawkmoth. I placed them on some tomato seedlings that came up in the compost pile as the larvae have a sweet tooth for the fruit in preference to the foliage. Insects on ice – There’s more invertebrate activity in winter than you might think! Even people who don’t like winter will grudgingly admit “well, at least, there’s no bugs.” Guess again. Insects are indeed out and about in the winter woods. The good news, however, is that the species you’re most likely to encounter ‑ the minuscule snow flea ‑ has no interest in humans. Even better, like the return of cardinal and chickadee song, its presence is a sign that spring is fast approaching.
. It belongs to an ancient group of wingless invertebrates called Collembola, commonly known as springtails. Along with other species of springtails, snow fleas are among the most abundant insects known to science. Tens of thousands can be found in a square metre of soil. For most of the year, they live beneath the forest floor, dining on algae, leaf mould and other fungi. They are part of a group of organisms known as decomposers, which turn organic material into soil nutrients that are essential for plant growth. This, in turn, allows other animals to feed on the plants, which are the foundation of the food chain. 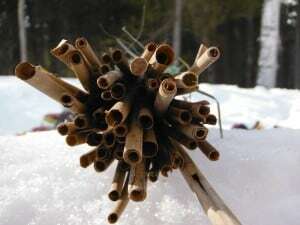 On mild, mid- to later winter days, snow fleas take advantage of the melted area around the base of trees to spread out on the surface of the snow. 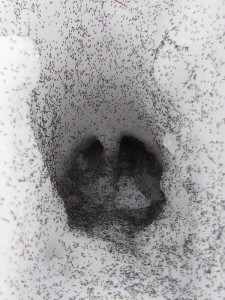 They will also make their way to surface via the deep tracks of deer. I often see them on or adjacent to the trails of the Kawartha Nordic Ski Club on Highway 28, near Haultain. They sometimes congregate in such numbers as to turn sections of the trail black. If you crouch down for a closer look, what initially appears like particles of soot or pepper will start jumping about in front of you, often completely disappearing from view. Only about 1 mm in length, snow fleas accomplish their incredible leaps thanks to a forked appendage called the furcula, which is attached to the tip of the abdomen. Most of the time, it is folded under the abdomen and held in place by a tiny latch, or tenaculum. When the snow flea decides its time to move, it arches its body, thereby releasing the latch. Loaded with elastic energy, the furcula swings down and sends the tiny insect catapulting skyward. It can, in fact, hurdle itself an amazing 13 centimetres, which represents 65 times its body length. In human terms, that’s like being able to jump the length of a football field! Insects are exothermic, which means that their body temperature and activity level depend on the air temperature. The cold usually renders them inactive. The snow flea, however, has overcome these limits and thrives in sub-zero environments. First of all, its black coloration allows efficient absorption of heat from the sun. The microclimate in the sheltered spaces between the ice crystals is also substantially warmer than the surrounding air. In addition, four hundred million years of evolution have allowed snow fleas to produce a kind of natural anti-freeze. Researchers at Queen’s University have actually synthesised this protein, which is unlike any other previously known to science. They hope that similar proteins may be used for storing transplant organs. By preventing the formation of ice crystals in tissues, organs could be stored at lower temperatures and therefore remain available for transplants over longer periods. What are snow fleas doing out on the snow, when most self‑respecting insects are overwintering as eggs, larvae, pupa or inactive adults? It was once thought that they emerged to feed on microscopic algae, bacteria and fungi on the snow’s surface. This, however, has been disproved. A new hypothesis is that by late winter they have reproduced to a point where space is at a premium. The overcrowding means that some have to escape to the surface, where they simply wander around aimlessly until colder temperatures force them back under the snow and into the soil. There is also some doubt whether snow fleas are even insects. Their primitive anatomy has much in common with hexapods, an even more ancient group of invertebrates from which insects are believed to have evolved. Like countless other areas of science, so much about snow fleas remains shrouded in mystery. Another insect to watch for at this time of year is the winter stonefly. On mild, sunny days, adult stoneflies can be seen crawling over the snow in areas close to running water. They are weak fliers and do not stray far from the water’s edge. Like gray squirrels, skunks and great horned owls, stoneflies seek out partners early in the season to beat the spring mating rush. After mating, the female returns to the frigid water of the stream to lay her eggs. The stonefly’s life cycle is quite unusual. After the eggs hatch in the spring, the larvae bury themselves in the mud of the streambed, where they lie dormant all summer. In this way, they avoid dangers such as fish predation, low summer oxygen levels and fluctuating water flows. They emerge from the mud in late November, grow quickly into the adult stage and are ready to mate by mid‑winter. 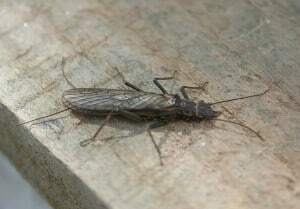 One species commonly seen along Jackson Creek in Peterborough is the small winter stonefly (Capnis genus). I often find them on the snow adjacent to the creek. This stonefly is black, measures about eight millimetres in length, and folds its wings flat over its back. It has two prominent tails (cerci). Since stoneflies require clean, moving water to survive, their presence is usually an indicator of good water quality. In some jurisdictions, winter stonefly numbers are closely monitored to gauge the health of rivers and streams. There are a couple of other insects to watch for if you’re out in the woods this winter. Snow scorpionflies (Boreus brumalis), dark-bodied insects about seven millimetres in length, are active on mild winter days. Look for them on or near the moss in which they develop. 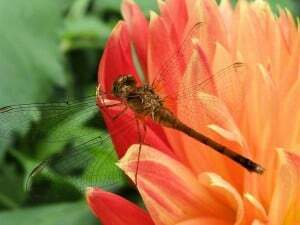 Males have only rudimentary wings, while females have no wings at all. The latter have a prominent ovipositor, however, which is used for laying eggs. Near streams, keep an eye open for the wingless winter crane fly (Chionea genus). At first, you may dismiss it as a lost spider, but a quick count of the legs ‑ six instead of eight ‑ will prove that it is indeed an insect. Its dark‑brown colouration makes the winter crane fly easy to see against the snow. You may be familiar with the crane flies we see in summer. They look like giant mosquitoes with a wingspan of about three centimetres and extremely long legs. The winter crane fly has evolved as a wingless, smaller‑sized version of its summer cousin with special adaptations to winter life. To the curious and mindful observer, there is far more going on in the winter woods than first meets the eye. As with so much in nature, it’s mostly a matter of being patient and paying attention. If you think from reading the title that you are about to read an excerpt from a steamy romance novel, I am afraid you might be disappointed. 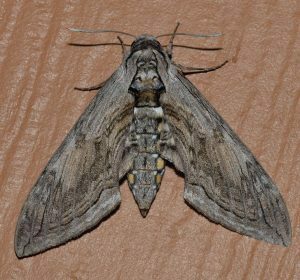 If, however, you have an interest in where moths go during the cold months, then I hope you`ll find the following of interest. Frozen, quiet, and white, is the landscape at this time of year. of a pair of ravens as they roll through the sky together in early-season courtship. And what about the night? Apart from the occasional hoot of an owl, the mournful lament of distant coyotes, or the sudden crack of a tree as it freezes, much of the winter night seems to be truly asleep. Although there actually is a lot going on during this sleepy season, there are moments when the lack of sounds brings back not-too-distant memories of the seasons of more abundant audible presence. What natural sounds do we not hear during the winter? “Most”, I think, would be the best word to answer that question. For instance, many more than half of the bird species that breed here, have flown to distant southern lands, and have taken all of their various chatter, chirps, and songs with them. Spring-singing amphibians (the frogs and toads) too, have disappeared into mud and leaf litter, and have retreated into a silent absence. We generally do not hear anything from them for months. (Though I now have heard at least once, a spring peeper within every month on the calendar. This will occur in any of the colder months if the temperature rises enough above freezing, and maintains for enough consecutive days and nights, that a few of the little frogs are able to thaw out and utter occasional and very weak “peeps”). So, what about the insects? In the frozen grip of winter, we no longer hear the piercing grind of the cicadas of summer, the chirps of crickets of early autumn, nor the springtime rattle of June Bugs as they bang about out on the porch after dark. Similarly, (and one of my favorite sounds), the whirling rush of moth wings as they circle my head beneath the porch light, is absent now as well. But, on this frozen January day, “Where have all of those moths gone?”, you might ask. Well, not only are they here, but depending on the species, most are over-wintering in various stages of their life cycles. 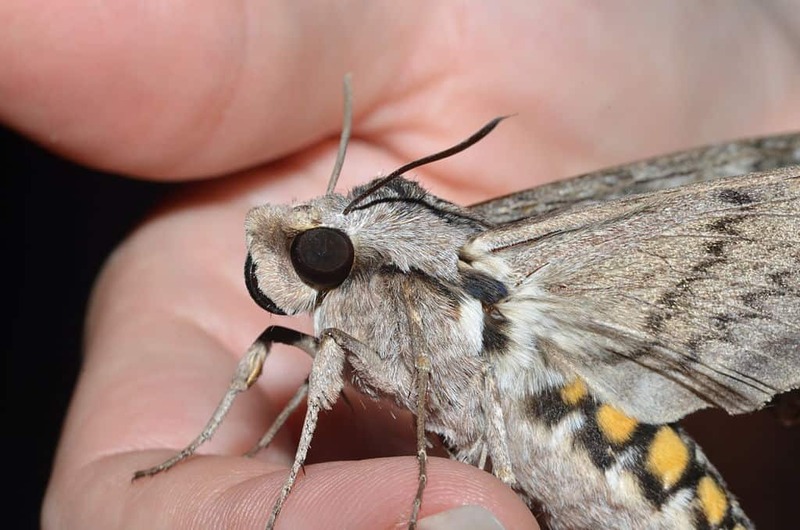 Some species, (like the cutworms and other noctuids), and depending on the species, over-winter as adults, or as eggs, as larvae, or as pupae,,, and many are indeed alive and well in the Kawarthas right now! 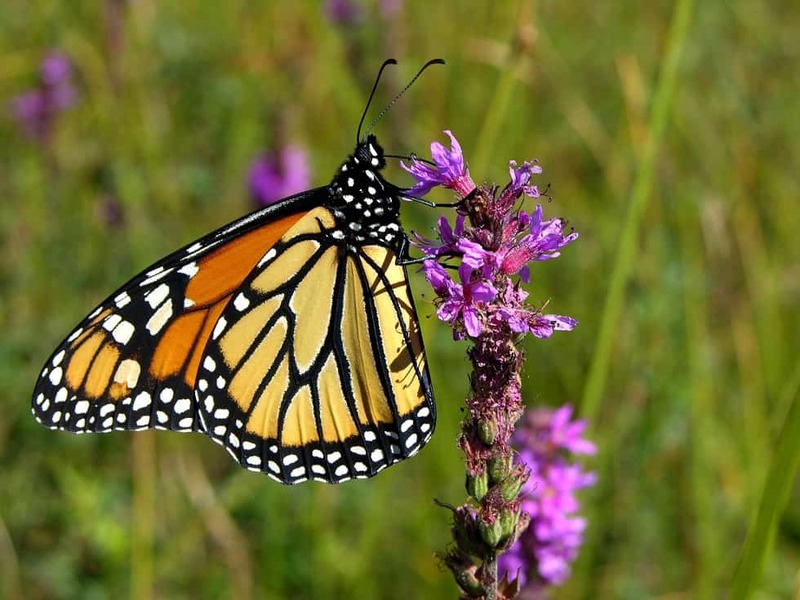 Other species may only be here in one form or another throughout the winter months, while others are believed to only migrate into Ontario each spring/summer season. In the case of the latter, it could also be that some migrate out of the area before winter arrives, and/or otherwise die off here completely each fall. It is not at all uncommon to see the familiar “Woolly Bear” caterpillar on a mild late autumn (or even mid-winter) day. I have seen them crossing roads, crawling about in the garden, and sometimes moving around through piles of stacked firewood. And most often during the same milder days that I have heard the much-out-of-season Spring Peeper frogs call out. Woolly Bear caterpillars are the larval stage of the Isabella Tiger Moth, which is a member of the family “Arctiidae”, and this species over-winters in the larva stage. There is an old wives’ tale that suggests that you can predict the severity of the coming winter, based on the thickness ratio of brown to black colour bands of the Woolly Bears’ bristly coat. Though it may be fun to fancy such an idea, it is simply not true. 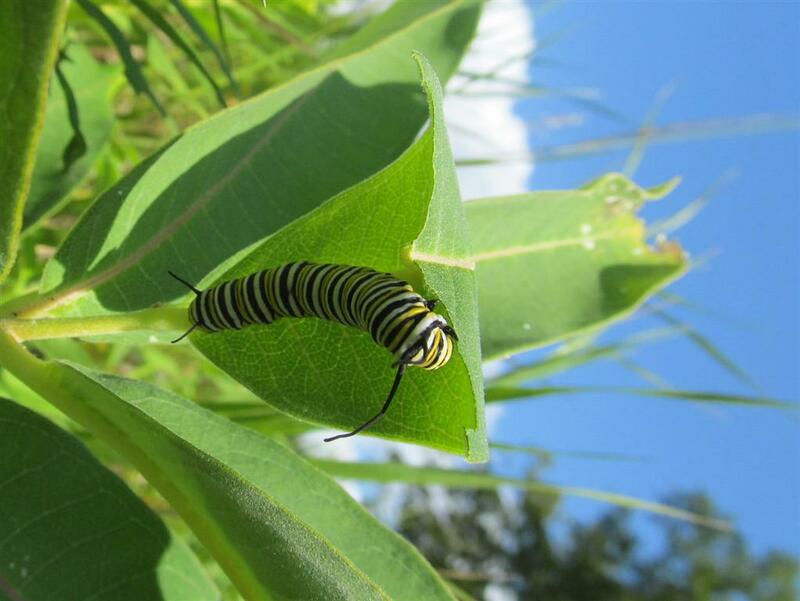 As the larva sheds its skins throughout the fall, they begin with much more black, and acquire more brown in the last skin stage, (which is called an instar), as they head into late fall. 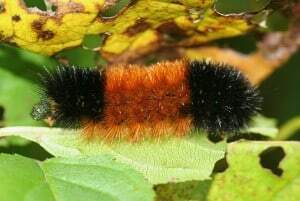 So, if you see a Woolly Bear in September, it might indicate the approach of an entirely different kind of winter, than if you saw the very same individual in November. A large number of moth species found in this area over-winter in the egg stage. About thirty of these are members of one of my favorite groups – the Catocala, or “underwing moths”. As winter weather deposits snow, ice accretions, and all manner of frozen water upon the branches of trees, beneath the icy coating lies much tiny, suspended life in the form of fertile moth eggs. “Moth seeds” is what I like to call them. I have, and with great difficulty, managed to find these eggs on occasion, but it is not something I would recommend that one should try, unless one has at least as much patience, as they do a desire to see them. They are most often found in cracks and furrows in the bark of outer branches, where they were “glued” by the female moth with a special adhesive that each egg has to pass through as it is layed. 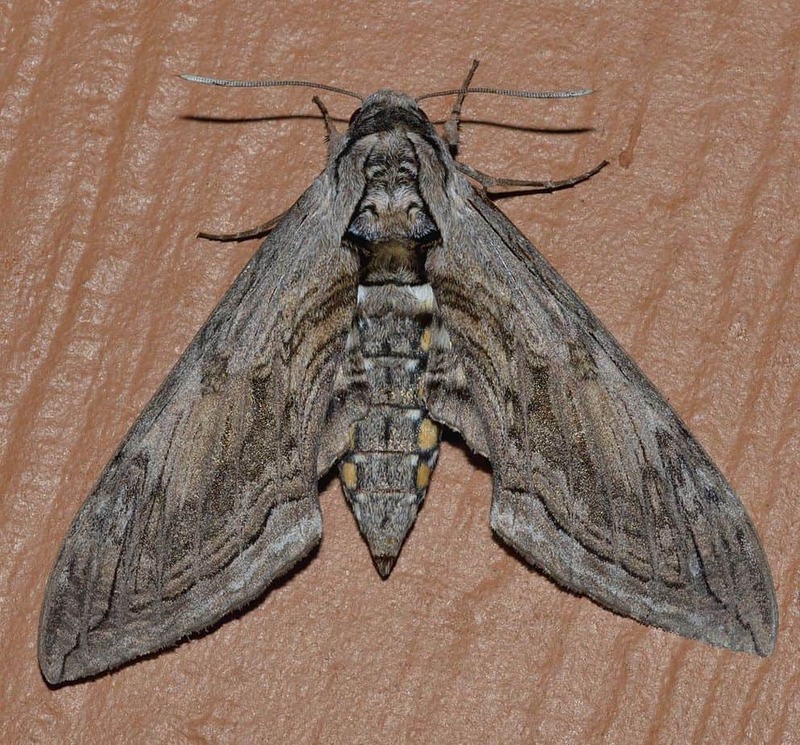 As is the case with all the underwing moths, the eggs have been layed on the various host trees, specific to the particular species of moth, so that when they hatch in May and June, (and once the leaves are out), the proper food is just a short crawl away for the tiny larvae. So, enough explanation about the very difficult-to-find moth eggs in winter. Lets look for something much easier to find. The Saturnids, (silkmoths), spend their winter here in the pupa stage. Some species in this area, like the Imperial Moth, the Pink-striped Oakworm Moth, and the Rosy Maple Moth, are “earth-pupators”. These are some of the many species of moths that, as larvae, burrow into leaf litter and soil before splitting out of their final larval skin and thus, become a pupa. 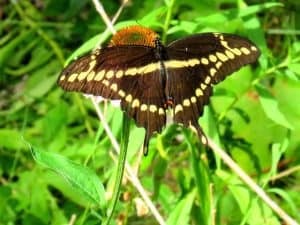 They wiggle about until they have shaped somewhat of a small, earthen chamber, which to a point, hardens some by the time the pupa has completely transformed . In the case of the saturnids, they will stay in these chambers until the earth has warmed enough in late spring and early summer, and then will split out of the pupal shell, find their way back to the surface, and climb something high enough that their wing veins can fill with fluid and harden without worry of drying mis-shaped, as they might if they were to come into contact with something inhibiting free, open-air expansion. Some of the other silkmoths, (the species of silk-spinners giving the group its common name), as mature larvae, will find a place on a twig, and spin a silken outer cocoon. Once it has completely covered itself in its outer “sleeping bag”, it will spin a sort of cylindrical container inside the rough outer layers. The inner wall of this will become very hard and smooth. 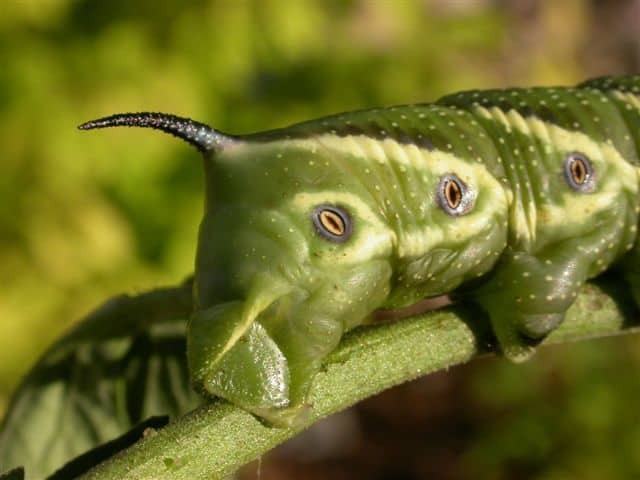 When the caterpillar is ready, it will shrink somewhat, and then split out of itself, and become a naked, brown pupa. This too, will soon harden, and although it may wiggle inside a little when warmed by the sun, it will otherwise be still until spring. 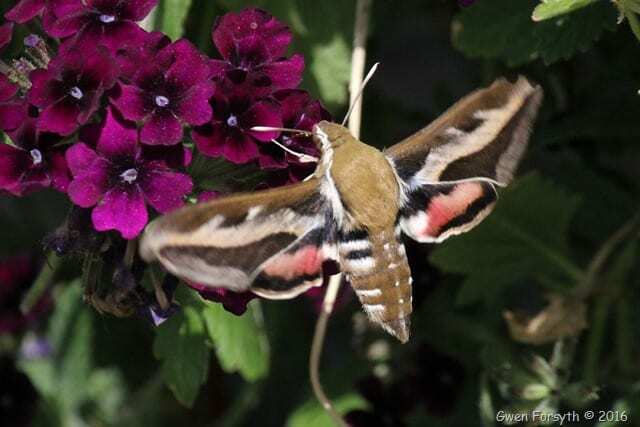 Species that you may spot in the winter either attached lengthwise on, or hanging from branches, are the cocoons of Cecropia Moth, Columbia Silkmoth, Polyphemus Moth, and Promethea Moth. The cocoons of others like the Luna Moth (and sometimes Polyphemus), though usually wrapped with silk in the green leaves of the host trees in the late summer, tend to fall to the forest floor in October with the rest of the leaves that fall from the trees then. They are not so often well-secured by silk to branches as some of the other species mentioned. The Cecropia, Columbia, and Promethea cocoons however, have a strong silk wrap, and to the trained eye, can be quite easy to find in the winter as they are visible on leafless trees. Promethea and Columbia larva rarely wander when it comes time to spin their silken cocoons, and most are usually found on the same individual tree whose leaves nourished the caterpillars throughout the summer. 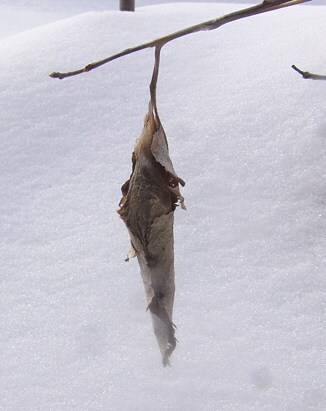 The larvae of the Columbia Silkmoth consume the deciduous needle-like leaves of the Tamarack, and the silken cocoons of that species are most often found on the upperside of very horizontal Tamarack branches in winter. The hanging, spindle-shaped cocoons of Promethea are most often found hanging near the tips of their two favorite larval host trees – the White Ash, and the Black Cherry. 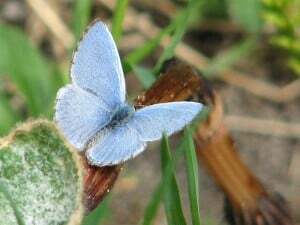 I have found them on a few other species before, but more than 90% of them in this part of the world can be expected to be found on the ashes and cherries. There is often from one to a few Promethea cocoons on a tree, but once in 2007 I found no less than nineteen cocoons on a single small Black Cherry tree!! (Though some were old and vacant, it should be noted that the whole combined lot no doubt represented at least a few generations). The largest cocoons, (out of which will eventually come the largest moths), are made by the Cecropia larvae. They will either stay put on their host tree, or some will wander off a fair distance before finding a branch or twig upon which to spin a winter sleeping bag. These can be quite large, (up to 4X10cm), and more often than not, are found to be rather solitary compared to Promethea cocoons. If you are hoping to see Cecropia cocoons in winter, groves of Speckled Alder (a popular larval host tree of the species) along lakeside marshes, and in river floodplain habitats are very often good places to start. If you happen to find one of these, (and it’s minus 25 out when you do), don’t worry too much for the “moth-to-be” contained within. Even though the naked little pupa inside is only wrapped in silk,,, it is wrapped in so much of it, (and is cold-blooded), that it is far more protected from the cold than you are in your many layers of heavy winter clothing. Even if you feel sorry for the moth inside, it is not a good idea at all to bring the cocoon indoors. Once it spends some weeks in a warmed house, it will complete development, and the moth will emerge many weeks before it would have done if left outside in the natural environment where you had found it. It is best to just leave it be, and return, (daily if you can), in late May if the spring has been particularly warm, or during the first week of June, if it has been a cool-to-average spring. 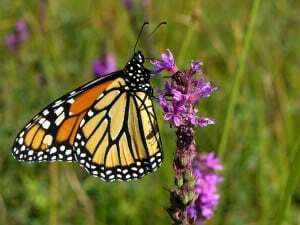 They emerge in the morning, and you can see them then, in full splendor! Later that evening, they will take off, mate, and continue their kind. The stingers of summer: Are wasps, hornets and yellowjackets ruining your outdoor enjoyment? As pleasant as a late summer picnic might be, there always seems to be a handful of unwanted guests. Like corn-on-the-cob, tomatoes and blueberry pie, hornets and yellowjackets are often part of a late summer outside meal. They would be little more than an annoyance if it wasn’t for the fact that they can deliver a painful sting. People often refer to all black and yellow stinging insects as “bees.” However, bees have a more robust build than wasps and are quite hairy. 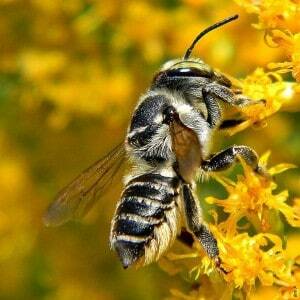 Their hind legs are flattened for collecting and transporting pollen. Wasps, on the other hand, have a slender body with a narrow waist, more cylindrical legs and appear smoothed-skinned and shiny. 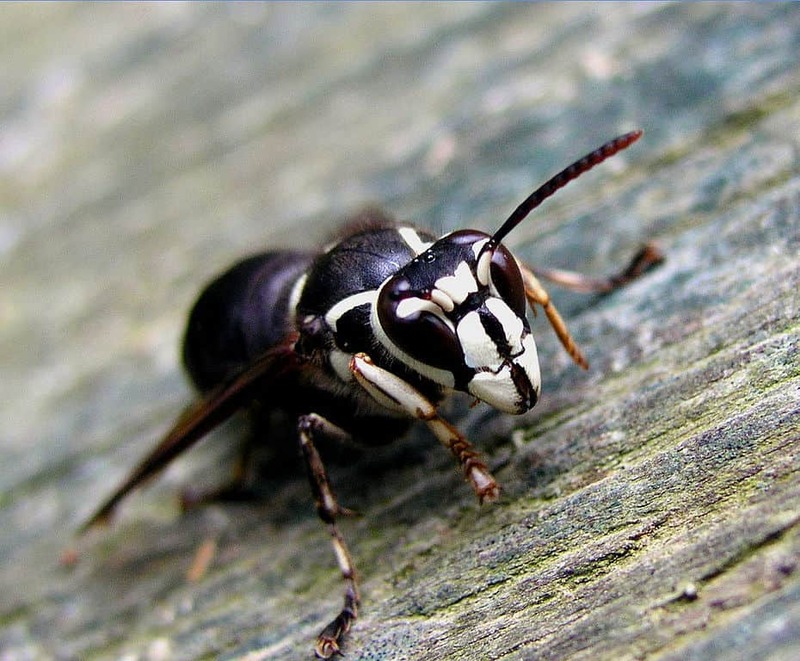 Yellowjackets and Bald-faced Hornets are the most common types of wasps that we encounter in the Kawarthas. 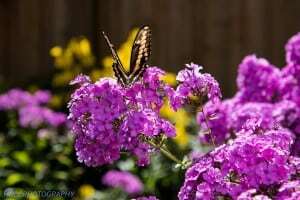 They are both members of a family of insects known as the Vespidae, which, in turn, is part of the much larger order Hymenoptera, or bees, wasps and ants. Most of the Vespidae are social wasps that nest in colonies. The terms “hornet” and “yellowjacket” are loosely used for many types of Vespids that build paper nests and have black and yellow (or white) markings on the abdomen. Like honey bees, Vespid wasps live in “societies of heavily armed females,” as Tim Tiner and Doug Bennett describe them in their book “Wild City.” To understand how these societies are structured, we need to go back to last fall. Having mated and carrying a year’s supply of sperm, young queen wasps spend the winter hibernating alone in crevices. 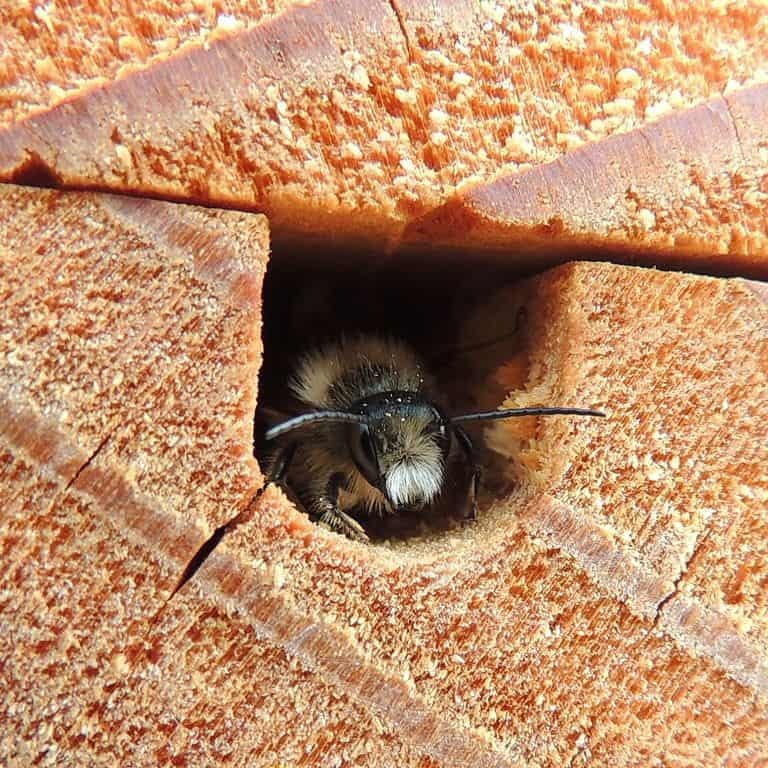 When spring arrives, each queen begins the process of starting a new colony by gathering wood fiber to masticate into a pulp, which dries into a paper-like nesting material. Depending on the species, the nest will be located in an underground cavity or aboveground attached to trees or buildings. The queen starts the nest by constructing several hexagonal, egg-carton-like cells suspended from a short stalk and enveloped with a paper covering. She then proceeds to lay an egg in each cell. A week or so later, the eggs hatch and the busy queen must then feed the larvae small pieces of protein rich food such as bits of caterpillar or carrion. After about 12 days, the outer skin of the worm like larvae hardens into a tough casing. The developing wasp is now called a pupa and will undergo a radical change in form. Pupae do not eat. After another 12 days, an adult wasp emerges from each of the pupal cases. All of these individuals are sterile females called workers. They immediately begin to work for the queen, enlarging the nest, gathering food and taking care of the new young. However, not all of their hard work is altruistic. In an amazing exchange of material called trophallaxis, the larvae secrete a sugar material relished by the workers. The queen, all the while, continues to lay eggs. As most everyone knows, the workers are armed and dangerous, especially when they perceive a threat to the colony. 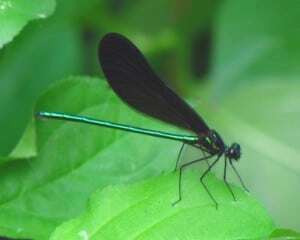 Because these females are also sterile, they do not use their ovipositor as an egg-laying tube. Rather, it has been modified into a stinger, which is able to pierce the skin and inject a small amount of venom. Unlike Honey Bees, which have barbs on the stinger that cause it to break off when pulled out (thereby killing the bee), wasps lack these barbs and can therefore deliver multiple stings over the course of their lives. 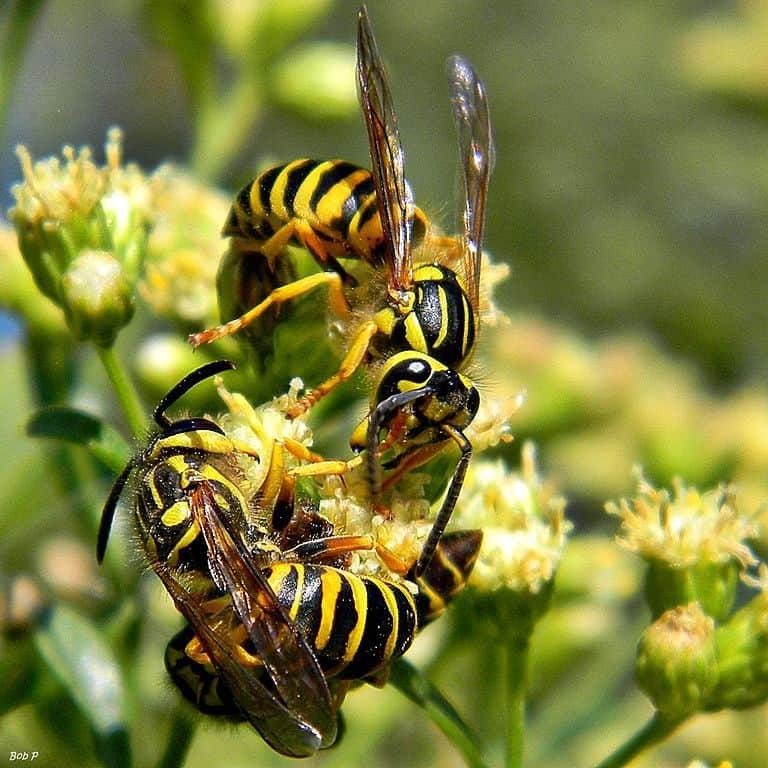 Wasps tend to be most aggressive in late summer, maybe because of the large number of offspring in the nest, which offers a great nutrient jackpot to predators like raccoons, skunks and bears. As fall approaches, something unique happens. Sensing the shorter days, the queen begins to lay unfertilized eggs that will develop either into males (drones) or into new queens. These individuals will go on to mate, but only the newly fertilized females have the ability to overwinter. The rest of the colony dies including the hardworking queen with the first hard frosts of fall. 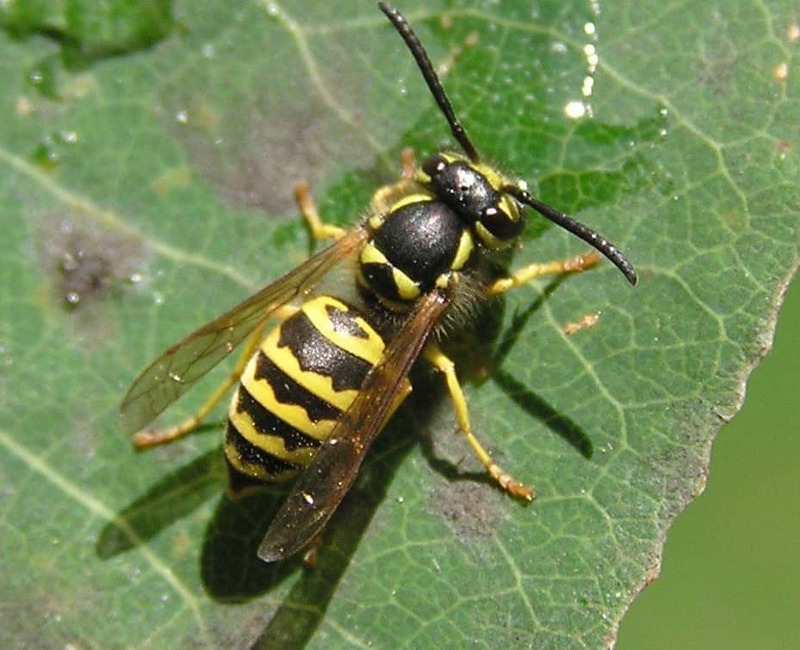 One of the most commonly-seen Vespid wasps is the Eastern Yellowjacket (Vespula malculifrons). 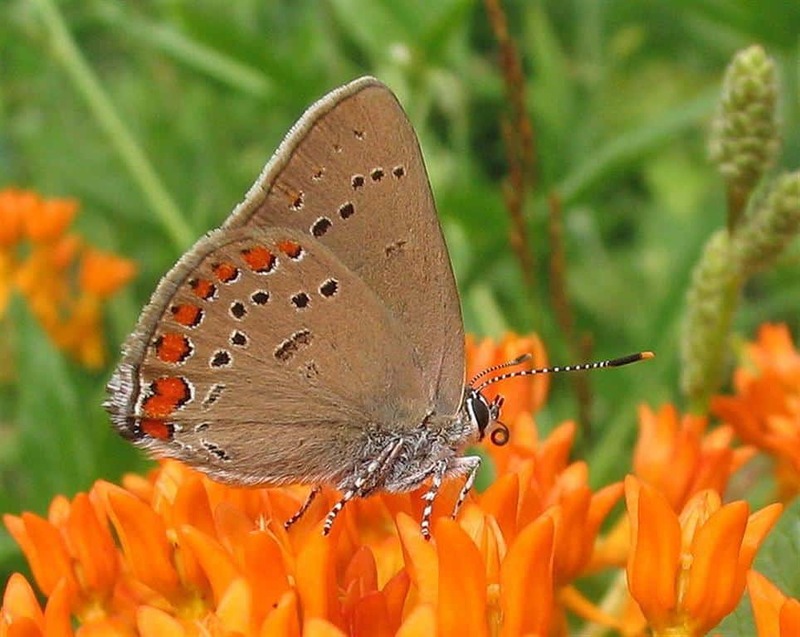 It can be identified by the triangular, black “anchor-shaped” marking on the segment of the abdomen nearest the thorax. 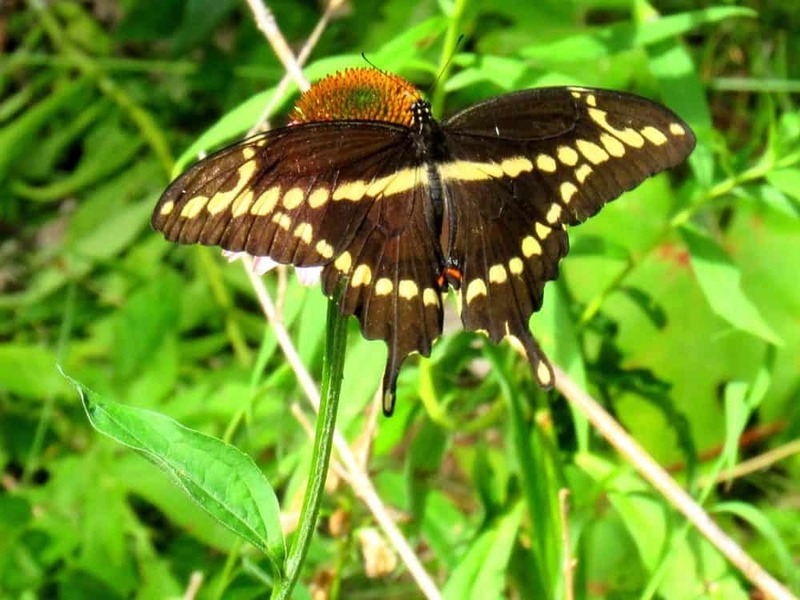 The triangle has a narrow black stem or neck, which extends to the upper edge of the abdomen. Yellowjackets usually nest in the ground, often in an abandoned animal burrow. As summer ends, there is a frantic search for food to feed the thousands of larvae still in the nest. Caterpillars are the larval food of preference but these wasps will also turn to dead insects and to human foods as a source of protein for the colony. Adults also need sugar in order to fuel the energy requirements of their own bodies. In addition to what they receive through trophallaxis, some of their favorite sources of sugar include flower nectar (especially goldenrod), ripe fruit and aphid honeydew, which is usually gleaned from tree leaves. However, as we know all too well, wasps are also attracted to the same sweet drinks as humans. Hot, dry summers provide the best breeding conditions for wasps, because this kind of weather also means high survival rates for the insects on which wasps feed. 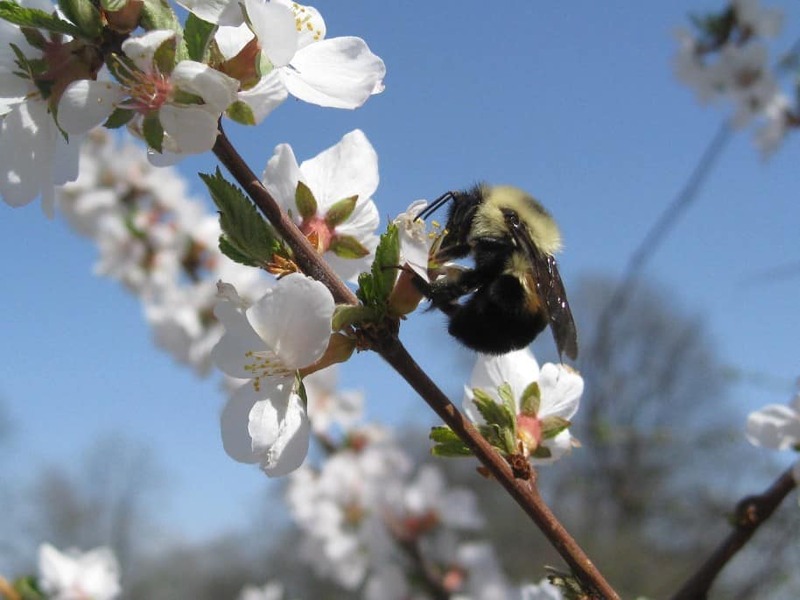 Under these conditions, yellowjacket colonies can expand rapidly. 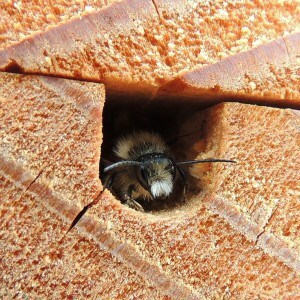 Some will have as many as 4,000 to 5,000 workers and a nest of 10,000 to 15,000 cells by summer’s end. The Bald faced Hornet (Dolichovespula maculata) is another common Vespid. It is a little larger than a yellowjacket and has a mostly black body with yellowish white markings on the side and face. 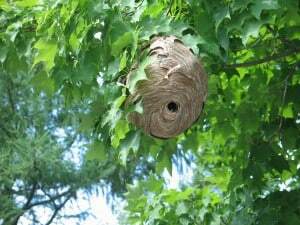 Hornets catch our attention because of their habit of building globular paper nests in trees. All summer long, colonies of these insects chew the fiber of trees and boards. Like yellowjackets, they turn the fiber into a saliva soaked pulp that dries into the fine, grey paper walls of the nests. The nest starts out small but grows in progressive layers over the course of the summer. A large colony can harbor up to 600 individual hornets by September. They are a species that needs to be treated with respect. After the first few weeks of frost, it is safe to open an old hornet to see the intricate design and various levels of nesting tiers. 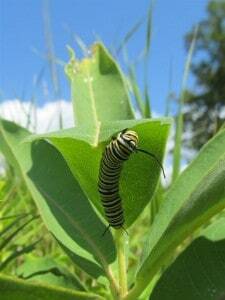 There are usually some cells with dead larvae and pupae, as well. No wasps, including the new queens, ever overwinter in the nest. 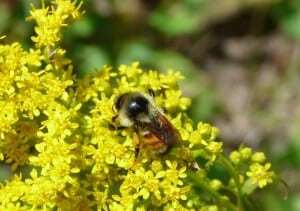 Usually by late August, egg laying ceases in yellowjacket and hornet colonies and there are fewer larvae to feed. Consequently, the workers are no longer receiving sugar from the larvae in exchange for protein. They therefore start to abandon the nest to satisfy their own all-consuming sweet tooth. With a sugar fix in mind, wasps will sometimes descend upon family picnics, backyard barbecues and schoolyards full of juice-drinking children. These “bees”, as kids mistakenly call them, can be a real problem, especially around open garbage pails full of discarded juice containers. Like all living creatures, wasps play an important ecological role. 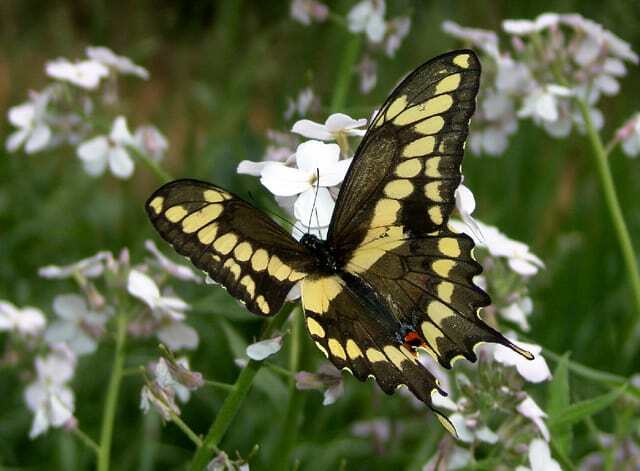 Because most Vespids prey on insects and other arthropods, they help to control the numbers of many pest species. It takes a lot of bugs to feed a hungry brood. Yellowjackets also scavenge dead insects to feed their offspring – an important ecological service, too. 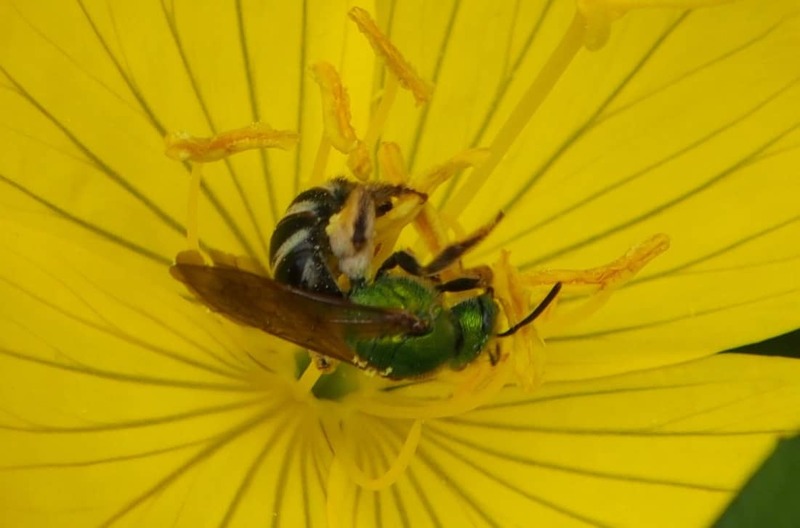 Some species of wasps are also important pollinators. Fig trees, for example, depend entirely on wasps for pollination. In fact, the relationship between fig trees and fig wasps is one of the best examples of co-evolution in the nature. The fig shaped the wasp and the wasp shaped the fig. Wasps are just one more example of how the natural world never ceases to amaze. 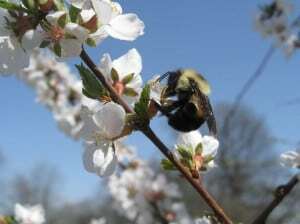 Note: The bumble bee shown in the photo is not a rare Rusty-patched Bumble Bee but rather a Tri-coloured Bumble Bee, which is a much more common species. NOTE: The web address for dragonfly and damselfly pictures was mistakenly omitted from the column.